There were several attempts using pork, chicken and turkey but they did not turn out like the store bought ones which are like floss and my results are more like bits. My discovery for a better result was when i had to make nutritious soups for my elder daughter during her confinement. i used chicken breasts and cooked the soup in a slow cooker for at least 3 hours and throwing the meat away was so wasteful so i cooked floss with the meat by skipping the cooking process. The meat was so tender and could be broken up by just using the fingers. The result was superb and i reaslised that the meat has to be extremely tender then the result will be light and flossy like although it is still not like the store bought ones. The flavor will be what sort of soup the meat is cooked in. Mix the rest of the ingredients except the meat and microwave for 30 seconds on high, stir to dissolve the sugar. In an heated wok fry the meat on medium heat, stirring and pressing meat with the wok spatula to loosen the meat that are clustered until all the meat are loosen and light. Sprinkle the seasoning, a little at a time, fry on medium low heat. Continue sprinkling with the rest of seasoning and taste to adjust to the right sweetness and saltiness. Fry continuously until meat is dry and flossy. This dish however you call it, is the real comfort food that is closest to home.It has been called, Mein Fun Koh, Mee Hoon Kuih, Pan Mein, Country style flat egg noodles, etc. This dish used to be poor man's diet in the good old days when you can buy a handful of ikan bilis for 10 cents and harvest the sayur manis from the backyard. 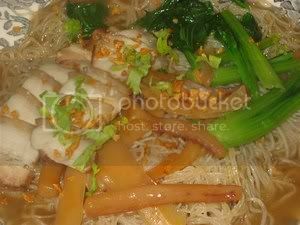 The most important part of this dish is that the dough has to be torn and drop into the soup that is why it is called 'koh' instead of 'mein' for noodles. 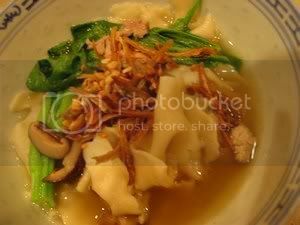 There is no need to starve when you crave for this, get the instant one, INA Pan Mee from http://mytasteofasia.com/., they are on sale now. Put all the ingredients for the dough in the food processor, pulse until dough is formed. Remove and leave in a ziploc bag to rest for at least 1 hour..
Bring water to a boil, add in half of the crispy ikan bilis , ikan bilis stock and shredded mushrooms. Cook for 8-10 minutes. Take a small piece of dough and rub with a little cooking oil, tear the dough into small and very thin pieces and drop them into the soup. As soon as the dough pieces float to the top, fish them up and leave aside. Repeat with the rest of the dough. Add the chicken/pork and bring back to the boil. When the meat is cooked, add choy sum, then put back the cooked dough pieces. Scoop into individual bowls .Add a dash of sesame oil and top with garnishings. Of all my ventures in bread making, i feel most satisfied with this as i have managed to bake something that Renee will eat. 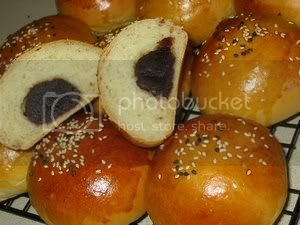 She thinks the tau sar is chocolate and will eat at least 2 especially when they are freshly baked. There are several interesting shapes which are pretty and fun to make but she will only eat these round ones, what is in their mind, who knows??????. I have posted just one basic sweet bread recipe here but i found that i do achieve success in any sweet bread recipes too . In the bowl of a stand mixer with the whisk attachment, whisk whole egg, water, sugar and butter until well mixed. Add all but 3/4 cup of the remaining flour and knead on low speed for 5 minutes. Check the consistency of the dough, add more flour if necessary; the dough should feel soft and moist but not sticky. Turn the dough out onto a lightly floured work surface(use the remaining flour); knead by hand about 30 seconds. Lightly oil a large bowl. Transfer the dough to the bowl, lightly oil the top of the dough, cover and let double in volume, 2 to 2 1/2 hours. Once the dough has risen, turn out onto a lightly floured surface. Portion the dough into 50 gm pieces; roll each piece into a ball and rest them for 5 minutes before going on to shaping. On a lightly floured surface, use a rolling pin to roll out a dough. Spread some red bean paste on it. Join the edges to form a ball. Roll the ball lightly to smoothen the surface. Brush the tops of the buns with egg wash (1 egg+1 tsp water) and sprinkle buns with some sesame seeds. Once the oven is ready, place the bread on the middle rack and bake until slightly golden on top, approximately 12 to 15 minutes. This is another Seremban classic and it used to be one of my favorite breakfast during my schooling years I wonder if this is still available in Seremban. It is easy to prepare if the dried Yau Yee is already reconstituted but very laborious for me here in the States where i would have to start from scratch. Marinate belly pork with seasonings. Heat 3 tbsp oil in the pressure cooker and then sear the belly pork until brown. Add in the stock and garlic(whole) and cook on high for 10 minutes. Release the pressure by putting the cooker under running cold water. Remove cover and check belly pork for tenderness(it must be still firm but tender). Remove the strips of pork to cool and then cut into slices. Return pressure cooker to the stove and bring the stock to the boil. Thicken gravy with the cornflour mixture and make sure that gravy has to come back to the boil. 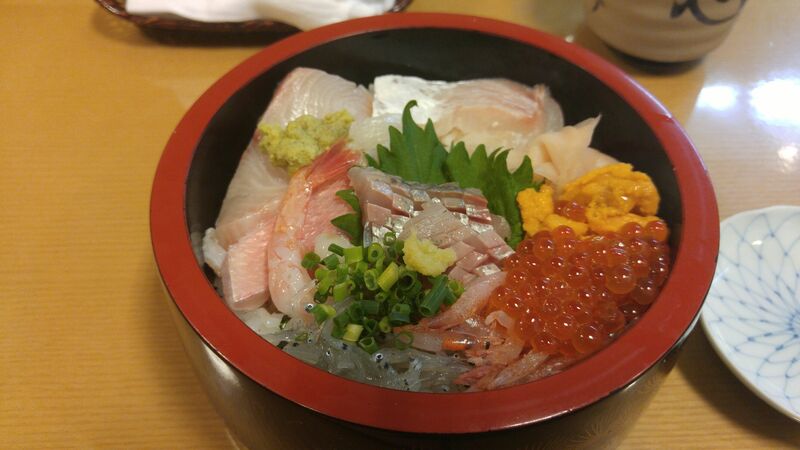 Season with salt or light soya sauce to taste. Keep gravy warm until ready to serve. Heat the wok until very hot, then add in 1 tsp oil. Put in the drained maifun(a handful) into the hot wok and add in another tsp of oil. When maifun is brown on one side turn it over. Remove and keep warm. Repeat until all the maifun is done. Bring a pot of water to the boil and blanch the Yau Yee. Slice the Yau Yee to bite size. Using the same water, bring it back to the boil and blanch the choy sum. 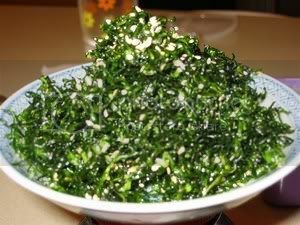 Place some maifun on a plate, top with Yau Yee, belly pork, choy sum, spring onions and fried garlic. Pour in the gravy before serving. Whenever i have 'kai lan' or chinese broccoli, i would use the older leaves to make this delightful dish. There is no wastage, even if the leaves have gone slightly yellow, they can be used too. I did not post this earlier although this dish is cooked practically everytime we have a 'kai lan' stirfry until my friend winnie told me that she learnt something new and i saw her picture, it was so beautifully done. Thank you winnie for reminding me. Although she used green cabbage, she told me that collard greens can be used too and i told her that i have seen Iron Chef - Kenichi , fry Shanghai Siew Pak choy in one of the battles. Remove the main stem from the leaves. Give them a spin or two in the salad spinner to dry or alternatively dry using kitchen towels. 'Chiffonade' the leaves by stacking individual leaves on top of each other, then roll up the leaves. Cut thin slices off the leaf roll to make long, thin strips. Heat oil and fry the thin strip of leaves until crispy. Remove with a strainer and when well drained, put them onto kitchen towel and sprinkle with sugar and salt. Mix thoroughly. I made more than enough batter for french crepes so have to transform it by adding in a few drops of pandan paste to make kuih dadar. Viola, the task was easy as i have cooked coconut filling in the freezer. Make a 'well' in the center of the flour mixture and add eggs, melted butter and half of the milk. With a shisk or wooden spoon, gradually stir the flour into the liquid mixture. While stirring gradually add more milk until the consistency is that of cream. 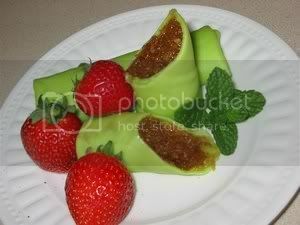 Put 2 tbsp of coconut filling and roll like you would the spring roll. Boil A to dissolve sugar. Add coconut, lower heat, stirring till almost dry. Add the cornflour mixture and cook for 5 minutes. As soon as i discovered that there is a malaysian girl in town and on her own, i had to invite her to visit and have lunch with us. We persuaded her to night stop and the next morning had to introduce her to our family american breakfast of crepes, sausages, scrambled eggs, maple syrup, strawberries and whipped cream. Poh Jee, hoped you have enjoyed the weekend with us. 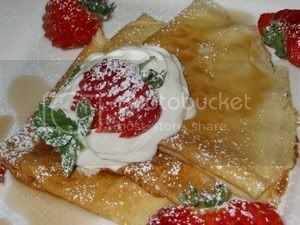 This recipe is so good and it is at the back of the crepe pan which is always there when i needed to make crepes. With a shisk or wooden spoon, gradually stir the flour into the liquid mixture. While stirring gradually add more milk until the consistency is that of cream. Pour 1/4 cup of the crepe batter into preheated pan. Cook both sides on low heat until lightly browned. There are many ways to dish out this most craved pasar malam delight and cooking it using the microwave will only take you 2 minutes to cook. 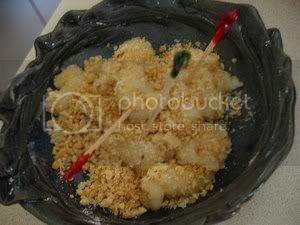 If you have glutinous rice flour and peanut brittles, this will be done in juffy. Mix glutinous rice flour, sugar, coconut milk, oil and water in a microwable bowl and microwave on high for 1 minute. Stir well and cook on high for another minute. Stir well, it should be cooked but if you are having a lower wattage microwave you might have to cook another minute more. Add the peanut, sesame seeds and sugar mixture to the dough and using an oiled scissor, snip into smaller pieces and coat well with peanuts. 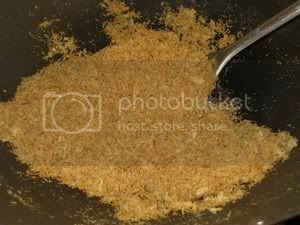 (if not serving the whole portion, remove a small piece enough to eat, and put into the coating, then snip from there. Remove the coated dough for serving and leave the coating for the rest of the dough). This is a very good marriage of sago , agar-agar and fruits of your choice. Be creative with this recipe. use coloring to enhance appearance or just do without, it is just as appealing. Mould in anyway you wish. Heat 4 cups water until boiling, slowly add sago while stirring constantly to prevent sticking. Cook 5 - 6 minutes over moderate heat. Drain sago, put sago under running water to rid of starch and then place in cold water to cool. Then drain. Bring 6 cups of water to the boil and add in agar agar. Cook until agar agar is completely dissolved, remove from heat and add in sugar and evaporated milk. Cook until sugar is totally dissolved. Add in sago and mango. 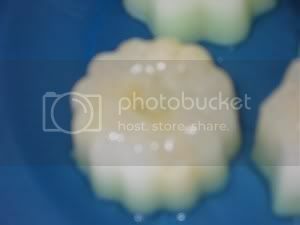 Pour into a 8 x 12 inch pan or small jelly moulds. Let cool and refrigerate until firm. agar agar strips can be substitute with gelatin or agar agar powder and follow instructions on package.